(Nanowerk News) Nanoparticles have the potential to revolutionize the medical industry, but they must possess a few critical properties. First, they need to target a specific region, so that they do not scatter throughout the body. They also require some sort of sensing method, so that doctors and researchers can track the particles. Finally, they need to perform their function at the right moment, ideally in response to a stimulus. The Nanoparticles by Design Unit at the Okinawa Institute of Science and Technology Graduate University is trying to develop new particles with unprecedented properties that still meet these requirements. Recently, Dr. Jeong-Hwan Kim took one step forward when he experimented with a new type of nanomaterial: the nanosheet. Specifically, he designed a strong, stable, and optically traceable smart 2-D material that responds to pH, or the acidity or basicity of its surrounding environment. 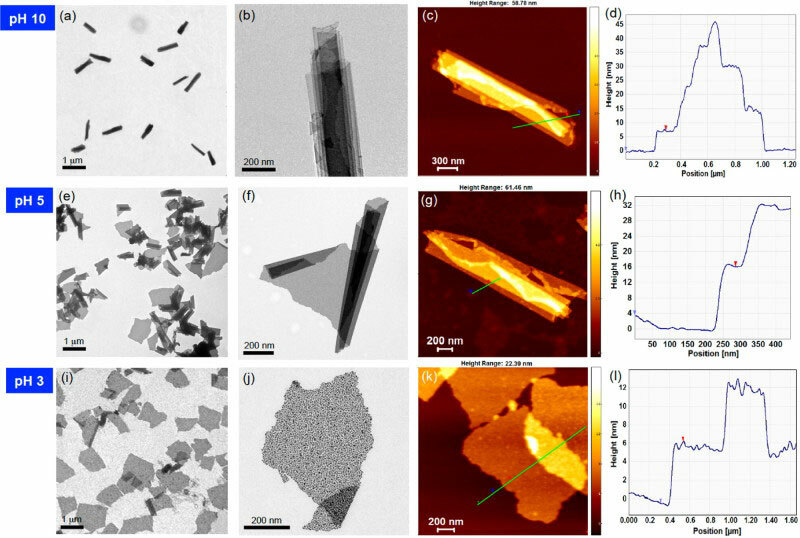 The American Chemical Society published his findings on August 12, 2014, in their journal, Applied Materials & Interfaces ("Smart Composite Nanosheets with Adaptive Optical Properties"). Nanosheets are unusual amongst nanotechnology because they do not exactly conform to nanoscale. The sheets that Kim produced are just a few nanometers thick, thin enough to earn the "nano" prefix. But their length and width can be measured in microns, sometimes with surface areas that can be measured in centimeters; much larger than typical nanostructures. Nanosheets' structure gives them the ability to change shape, from a flat surface to a scroll. Unfortunately, most nanosheets roll and unroll spontaneously. If researchers can design a nanosheet to change form in response to a stimulus, they can use it for a number of new applications. Kim tried adding different polymers to his nanosheets to make them responsive. For this experiment, he incorporated a relatively simple polymer that responds to pH. He found that the resulting nanosheet would always curl in basic, high pH conditions, and always flatten in acidic, low pH conditions. Kim also made his nanosheets responsive to near-infrared light, a wavelength of light that is harmless to humans. Depending on the shape of the nanosheet, the near-infrared radiation bounces back with a different wavelength. In this way, Kim can noninvasively track the nanosheets, even though he can't see them. Using these optical properties to characterize the nanosheets, Kim determined that he could approximate pH. Kim envisions biomedical engineers wrapping drugs inside of scrolled nanosheets so that when the sheet unrolls, it releases the medicine. 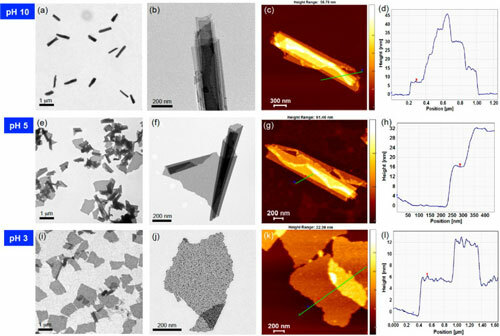 PH responsive nanosheets, for example, could prove useful for targeting different parts of the human digestive tract, which changes pH between the acidic stomach and basic intestines. Yet this is only the beginning; creating a responsive nanosheet is just a matter of adding the right polymer. "A nanosheet is like pizza dough," Kim said. "Whatever you like to put on it -- one topping, two toppings, anything -- you can." A nanosheet with a heat-sensitive polymer could burn surrounding tumors to destroy them, functioning as a kind of super-specific chemotherapy. "It's easy to get the nanosheets to the cancer cells," explains Kim. Targeting specific tissues is simply a matter of adding the appropriate biomarker, so that the body sends the nanosheet where it belongs. "The advantage of the rolling means that this nanosheet can entrap many markers or drugs securely inside the body," said Kim. By encapsulating a dangerous substance, such as a cancer-treating drug, into a nanosheet, doctors can attack very specific parts of the body. This would decrease the amount of the drug necessary and minimize side effects. "There are tons of smart polymers and metals," Kim said, explaining the many properties he hopes to incorporate into nanotechnology. "This new structure is composite, which means it allows us to mix all different kinds of components." Now, Kim just needs to build the right nanosheet for each purpose.